Of course the intensity, delving, monetary, and other qualities within the Taurus-Scorpio polarity are well known so let's not belabor such basics. We must look to the restrictive yet stabilizing Saturn rising for The Lesson-Bringer drags with him his usual karmic implications, and a serious tone of austerity, authority, and accountability is cast over proceedings as the Midterm Elections approach with Saturn the planet of lawmakers whose seats are up for grabs in November. Yet Saturn is also the status quo planet of The Establishment so it seems somewhat doubtful that all Republicans in office will be tossed out on their wide tushies even with the expected 'Blue Wave' of Democrats welling up across the land and spoiling for a cleansing flood. A mix of election results sounds more reasonable--yet this Syzygy Moon chart's MC-IC axis is at a critical-crisis 29th-degrees just as the Full Moon perfects. Matters are serious and strained and pressures must be released, perhaps partially in the T-Square between the Sun-Moon opposition squaring the 7th house North Node in dramatic Leo and suggesting new contacts and associations. 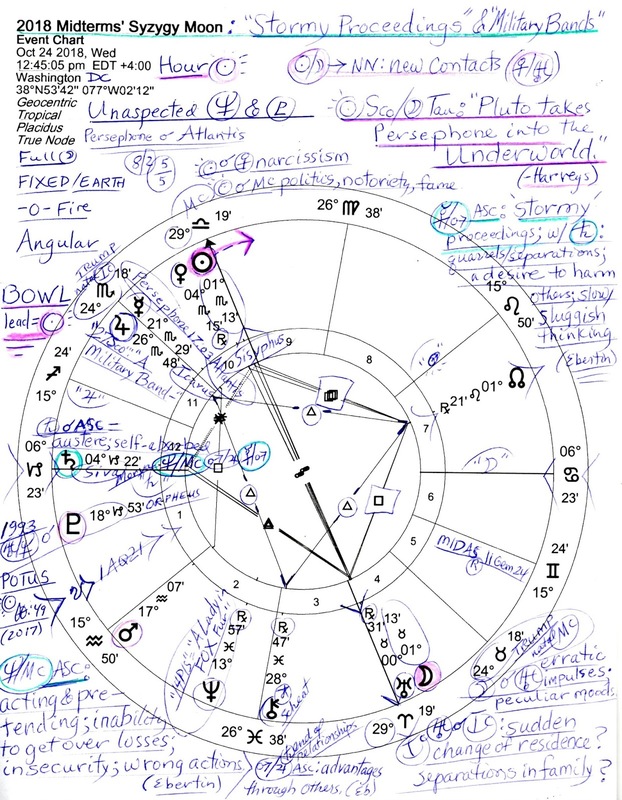 Yet necessarily the separative South Node, the Tail of the Dragon rises in 1st house, not the happiest indicator in any chart, along with wealthy manipulator and saboteur Pluto at that problematic degree of '18Capricorn' of POLITICAL POWER and 'smug or strong-armed paternalism' (Jones). Authoritarianism with its draconian measures are on the rise unless We The People stop it in its tracks soon. A values-laden 2nd house barely holds activist Mars desirous of reforms when in Aquarius while voting Mercury @21Sco29 has just entered the public 10th house at '22Scorpio' = "Hunters Starting Out For Ducks"...ENTERPRISE (Jones). This degree places transit Mercury nearing Mr. Trump's natal IC (24Sco18) from the 3rd house side with tr Jupiter in Scorpio, as noted above, on the 4th house side. Mercury-Jupiter opposite n MC may provide Jupiterian Trump a sense of optimism yet there are negative potentials involved with the planetary pair as well: failures through dishonesty; negligence or clumsiness; and fraud (Ebertin). Sadly, any or all of these possibilities may apply and I must also add grandiose thinking to this picture. Will an 'October Surprise' occur intended to sway the Midterms? Well, it's been years since one or more political 'surprises' (aka, dirty tricks) have not caused disruption of our elections or at least the fear of it--see disruptive chaos-creator Uranus at IC, the Basis of the Matter--which also suggests a sudden change of residence for someone! So let us agree that surprising events if not trickery will happen as 2018 rolls on toward November along with campaign promises--especially since at the 2018 Midterms, Jupiter will reach 29Scorpio which, rounded up, is "The Halloween Jester". And of course we can depend on tactics such as gerrymandering, voter suppression, foreign and domestic interference via hacking, and social networking illusions to haunt and muss with ballot boxes across the nation. And it isn't as if Trickster Trump the Gemini has supported any efforts to improve the 'integrity' of our voting system--things worked for him in 2016 so sly dog that he is, his 'Sneaky Mind' (Mercury-Neptune square--Oken) wouldn't willingly change a thing. Of interest as well is the separative South Node of the Moon @1AQ21 nearing POTUS Sun (Trump 2017 = 00AQ49) so endings of relationships and separations from the White House continue as will further unpopularity with the public (Nodes) for Mr. Trump which supports the theme of a culminating Full Moon and its Venus-Uranus/Sun-Uranus oppositions, plus, the Moon-Uranus separation issues and excitement that nestle at the IC. A quick glance at two horoscopes set for November 6, 2018 Washington DC show deceptive loss-leader Neptune of media, propaganda, falsehood, and the masses fame at IC (the Basis of the Matter; The Drain) at 8:00 am est and again at MC (The Goal) at 8:00 pm est. 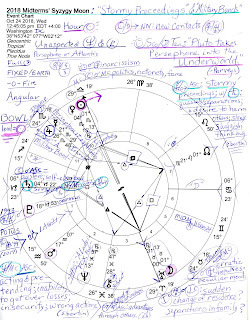 In the chart above we see Neptune @13Pi57 Rx in Money House (2nd) with the Sabian Symbol for '14Pisces' = "A Lady in FOX Fur" (my bold, for obvious political and broadcasting reasons). Neptune-MC = Ascendant: acting and pretending which also carries potentials for an inability to get over losses and/or insecurity (Ebertin). 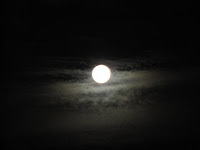 Sorry Trump fans but I see no "stable genius" acting under the spotlight of this particular Full Moon--and that doesn't take into consideration The Tower Solar Eclipse of August 11, 2018 @19Leo which is the Prenatal Eclipse of the November 2018 Midterms as previously discussed, and falls into the corporate and Scorpionic 8th house of this Full Moon chart. "Pluto takes Persephone into the Underworld" which may refer to the mobster/gangster atmosphere and dealings of Donald Trump and his thuggish minions such as Michael Cohen. Of course, the Persephone myth also relates to sexual relationships and abuse so there's that--and asteroids Persephone @17Scorpio (transition) and Atlantis (where we feel doomed; abuse of power) conjoin in the visible 10th house, while wounded healer Chiron, still in mystical if shady Pisces, is about to leave the 3rd house of Communications along with difficult Scheat @29Pisces, a star of misfortune. Is someone tweet-plaining their troubles? Still? Tiresome! Now I shall leave you to read the chart yourself or to check out my scribbled notes on the chart if you can or wish but I must note the relationship and culmination aspect of any Full Moon, shining its rays here upon the security-minded MC-IC axis of Career and Home, plus, the implications of a Venus-Uranus opposition of eccentricity, obstinacy, moodiness, separation in relationship, peculiarities, and/or someone's frayed nerves on display will add its excited energies to the sudden changes that are in store for America and Congress as we careen toward another Midterm Election Day. Related: from January 20, 2018 here's a brief FOX News interview concerning the 2018 Midterms with Michael Dukakis who was born in 1933 under the auspices of the Sun Scorpio-Moon Taurus blend of energies which will cosmically replay in the heavens via the 2018 Midterms' Syzygy Moon. Uranus returns to Aries at 10:58am PST. That will have an impact.